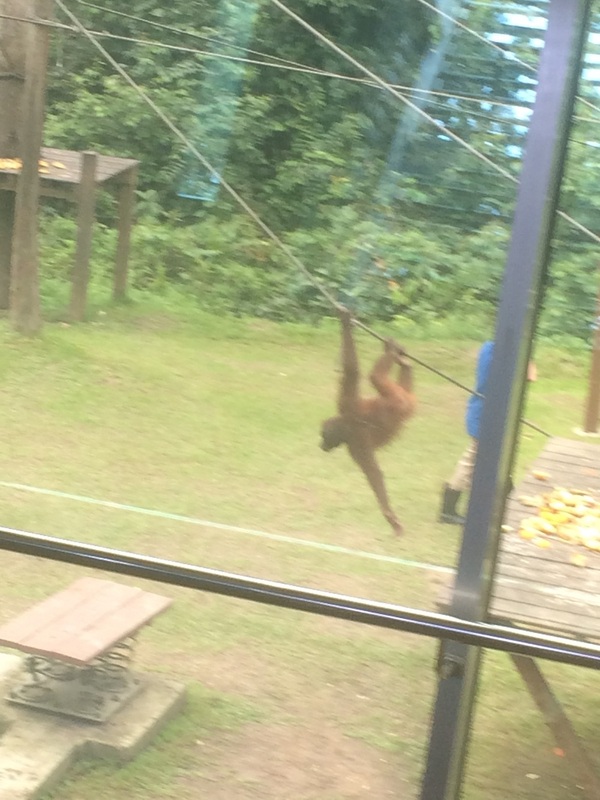 Malaysia with kids: Week 3 - Orang utans, sun bears and a river cruise! 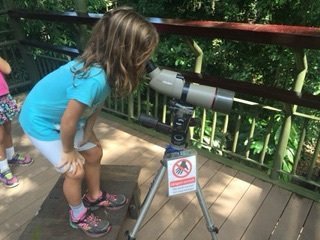 Malaysia with kids: Week 3 – Orang utans, sun bears and a river cruise! We spent our last few days in Malaysia in the State of Sabah, on the northeast part of the Island of Borneo. Our main reason for going there was to try and see the Pygmy elephants, as well as the orang utans and sun bears. We stayed at Paganakan Dii, which bills itself as a Rainforest retreat. There is not much rainforest left in Sabah, as it’s all been replaced with palm tree plantations. Retreat is also code for ‘far away from what you want to see’. 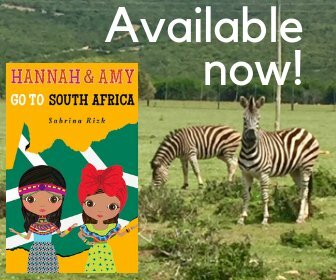 We had to drive on unpaved, bumpy roads to get to it, and many items on their limited menu were out of stock. Our room in Paganakan Dii. 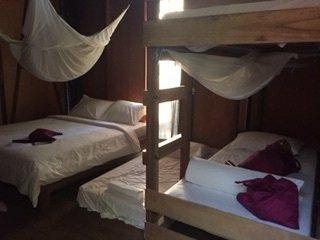 Between this and Mulu, we were in quite close quarters for 8 nights, with no pool to relax in. 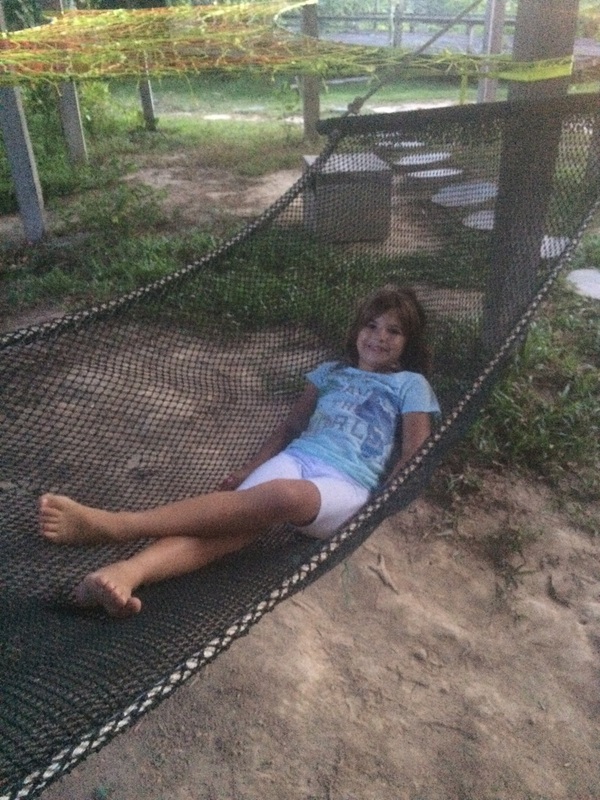 You could relax in these hammocks though. 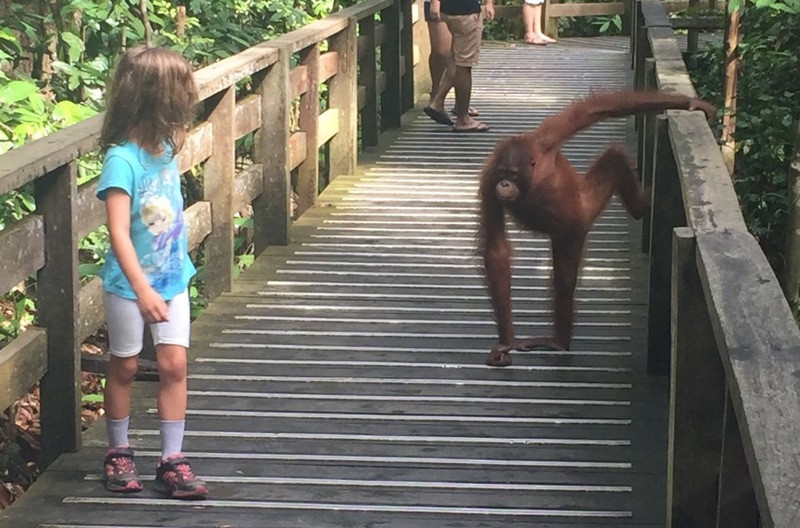 That said, the girls enjoyed the Sepilok Orang Utan Rehabilitation Center, particularly the outdoor nursery, where the younger ones wrestle, do somersaults and get into trouble with their keepers, just like little kids! The Center is on the edge of a forest reserve, and the older orang utans can come and go as they please – there is no fencing around. The outdoor nursery. The keepers have to keep the orang utans off the ground, as they would not be on the ground in the wild. Two older organ utans can often be sighted on the boardwalk. Those are the ones who like to steal things from tourists. 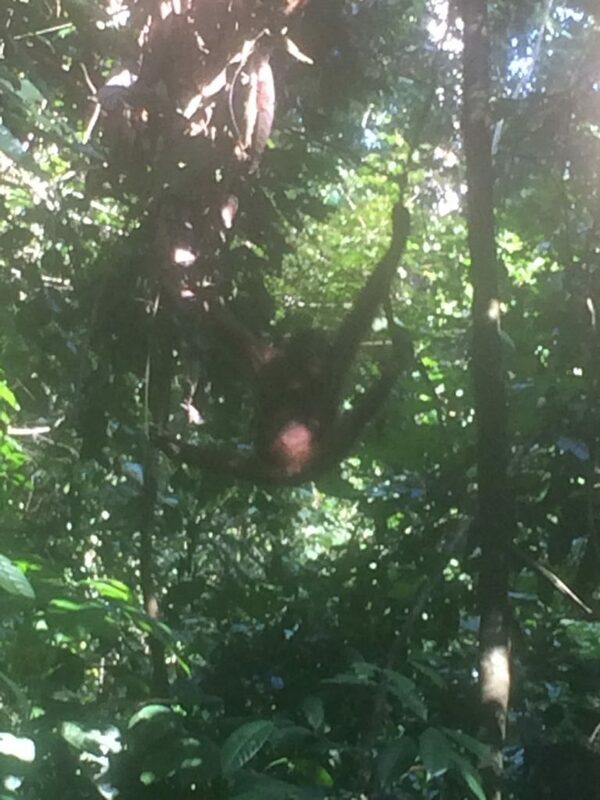 I also learned that the nearby Jungle Resort feeds them, so that they’ll come by the Resort. This works at cross-purposes with the Center’s goal of returning the orang utans to the wild. 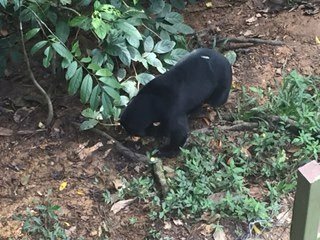 The Bornean Sun Bear Conservation Center just opened to the public last year (2014). There is only one viewing platform, so it doesn’t take very long to see the bears. The Center is working on adding more platforms. They have telescopes so you can get a nice, close view of the bears. Unfortunately, like the elephant tusks and rhino horns, sun bears are illegally taken for their bile. It is destined for China to be used for unproven medicinal purposes. Hence, the need for this rescue and rehabilitation facility. 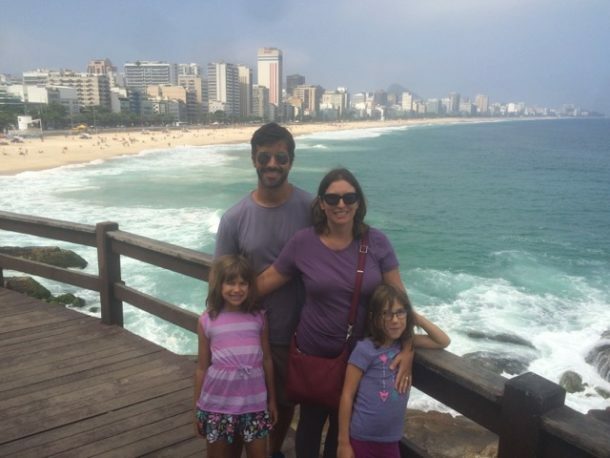 The next day, the girls and I made a quick stop at the Rainforest Discovery Center. 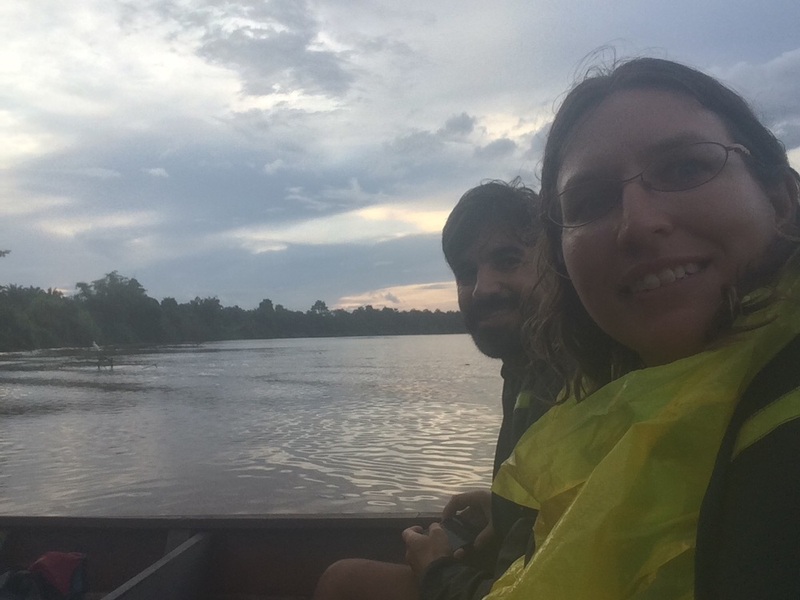 We then had a 2+ hour drive to the Kinabatangan River for a river cruise. This is where we were hoping to see the Pygmy elephants, but it was not to be. We saw lots of proboscis, silver leaf and macaque monkeys in the trees. We also saw a crocodile, horn bills, eagles, egrets and a beautiful kingfisher. 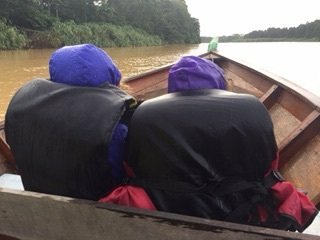 One thing we didn’t expect to see were palm trees, however; the palm oil plantations are coming right up to one side of the river. It rained during part of our riverboat cruise. We were in a longboat. The girls got bored in the river cruise. The river boat wasn’t fast enough for them and they had seen a lot of the same animals when we stayed in Kuching, Sarawak, on the west side of Borneo. 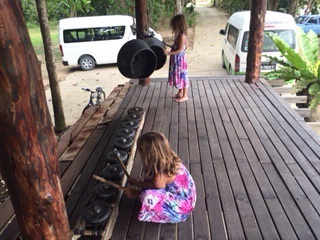 The girls liked the musical instruments they found at the Lodge where we took the cruise from. Anthony and I enjoyed the buffet dinner and talking with fellow travelers. We started to see some of the same people, as they were also doing the Borneo nature circuit. The girls really enjoyed playing these instruments. They were quite good at it. The next day was Amy’s birthday. She decided she didn’t want to go anywhere. Amy spent the morning using some of her presents, while Anthony applied for our Indian Visas (we’re still working on the train tickets). In the afternoon we decided to take a trip to town for ice cream, and once there went to see the orang utans again. We had some tears at dinner that night because Hannah wouldn’t wear her party hat to the restaurant, but the birthday cake made it all better. Yes! 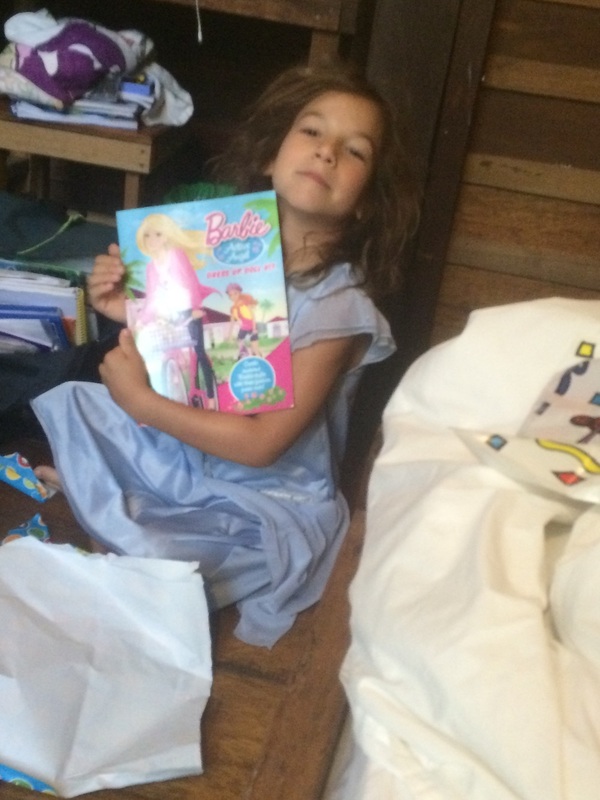 A Barbie paper doll book. Just what I wanted. 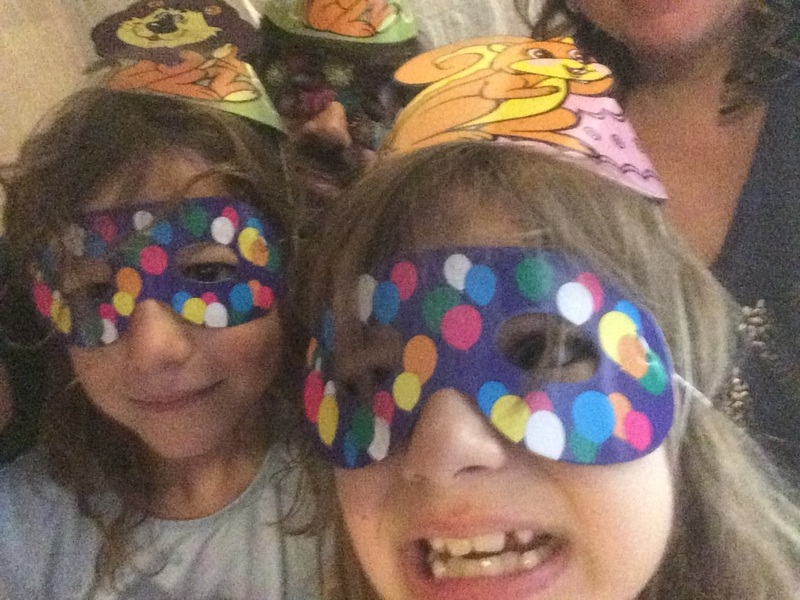 Party hats, masks, noise makers, balloons & candy. This is a party Pinkie Pie would approve of! The next day we flew to Thailand. At the airport in Malaysia, Amy decided she’d had enough. We had been traveling for 4 months at that point and Amy really wanted to go back to California to practice guitar. I thought about sending her to Toronto to stay with her Grandmother, Uncle and our cats, but knew she would start having fun again. To find out what we did to cheer her up, check out our first post from Thailand. Another day, another flight! 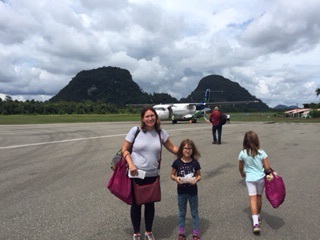 We took these small propeller planes across Borneo.